Bangladesh’s bid for a seat on the UN’s top human rights body should be rejected, as it fails to meet the basic membership criteria. The election of 18 new countries to the Human Rights Council will be held at the UN in New York tomorrow, October 12, 2018. See our full report on all candidates, and press release. While Bangladesh is known for receiving large numbers of Rohinyga Muslims fleeing ethnic cleansing in neighboring Burma (Myanmar), its treatment of those refugees and its overall record on human rights are problematic. In August 2017, some 646,000 Rohingya crossed into Bangladesh, more than doubling the refugee population in the country. The government initially refused the UN High Commissioner for Refugees (UNHCR) access to these new refugees, and for much of the year, restricted UNHCR’s access only to registered refugees, a small fraction of the actual number of Rohingya in the country. While Bangladesh offers the refugees some protection, it does not grant them asylum, and imposes restrictions that limit their ability to develop economically. Furthermore, in November 2017, Burma and Bangladesh announced an agreement to repatriate the refugees, sparking serious concerns that refugees’ rights to non-refoulment would be violated and they would be forcibly returned. Officially, Bangladesh is a democracy governed by the ruling Awami League (AL) party. However, the main opposition Bangladesh National Party (BNP) has had no representation in the government since it boycotted the 2014 elections to protest election irregularities. The other major opposition party, Jamaat-e-Islami, has been deprived of legal status since 2012 when the Supreme Court canceled its registration. Leaders in both parties are routinely subjected to arrests and harassment. Several laws limiting free speech are used to prosecute members of the opposition, journalists and civil society. In 2016, BNP opposition leader Khaleda Zia and two journalists were charged with sedition. According to Human Rights Watch, there were at least 30 assaults on journalists in 2017 and one murder of a journalist—Abdul Hakim Shimul in February 2017. Two journalists were detained in September due to their reporting on the Rohingya crisis. In August 2018, UN human rights experts called on the government to release photographer Sahidul Alam, who was arrested and allegedly tortured after critical reporting on a student protest. Dozens of Bangladeshi bloggers are in hiding or exile due to a fear of physical reprisals for their reporting. The government also restricts the rights of opposition members to freedom of assembly and association. Bangladesh’s security forces are known to commit extrajudicial killings, enforced disappearances, and torture. The government frequently justifies extrajudicial killings claiming the suspect died in a “gunfight.” Local human rights agencies estimated that some 160 individuals were killed extrajudicially in 2017. In one case, the family of Mazharul Islam claimed he was tortured to death after being arrested. Hospital records allegedly showed injuries to multiple parts of the victim’s body. One local human rights group reported 60 cases of enforced disappearance during the year. In August 2016, the sons of three former opposition politicians who had been executed, disappeared. One of them, Humam Quader Chowdhury, resurfaced seven months later, but the other two remain missing. It is suspected that journalist Utpal Das and professor Mubasher Hasan were forcibly disappeared during the year for periods of more than one month. In February 2017, the UN Working Group on Enforced Disappearances, whose request to visit the country has so far been denied, called on the government to halt the practice of enforced disappearances. In April, Swedish Radio published a secretly recorded interview with a senior member of the security forces who admitted to routine instances of murdering suspects and then disposing of the bodies. In July, a judicial inquiry concluded that enforced disappearances occurred and ordered the police to take action. The government has not responded to a request for a visit from the UN Working Group on Enforced Disappearances. The resignation of the Chief Justice in July 2017 raises serious questions about the independence of the judiciary in Bangladesh. The Chief Justice claims he was forced to resign for his role in overturning a 2014 constitutional amendment which had given parliament the right to remove judges. Negative: At the General Assembly, Bangladesh voted for a resolution denying countries the right to sanction regimes that abuse human rights, and voted to delay the work of the Special Rapporteur on violence against LGBT. While Bangladesh supported the resolution on Myanmar, it failed to support resolutions speaking out for human rights victims in North Korea, Syria and Iran. U.S. Dep’t of State, Bureau of Democracy, H.R. and Lab., Country Reports on Human Rights Practices Bangladesh 16-17 (2017) [hereinafter State Department Report on Bangladesh]. World Report 2018: Events of 2017, Human Rights Watch, 65 (2018) [hereinafter Human Rights Watch Report on Bangladesh 2017],, https://www.hrw.org/world-report/2018/country-chapters/bangladesh; Rohingya crisis: Bangladesh and Myanmar agree repatriation timeframe, BBC (Jan. 16, 2018), https://www.bbc.com/news/world-asia-42699602. 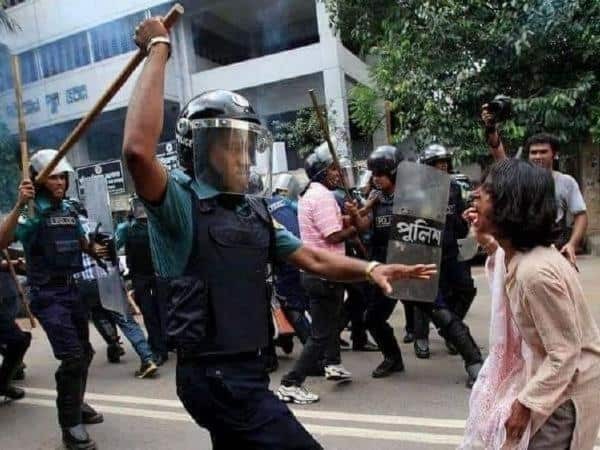 State Department Report on Bangladesh, supra note 26, at 21; Freedom in the World 2018: Bangladesh, Freedom House (2018), https://freedomhouse.org/report/freedom-world/2018/bangladesh. State Department Report on Bangladesh, supra note 26, at 22. Freedom in the World 2018: Bangladesh, supra note 30. Id. ; State Department Report on Bangladesh, supra note 26, at 12. State Department Report on Bangladesh, supra note 26, at 12. Human Rights Watch Report on Bangladesh, supra note 29. Bangladesh: UN human rights experts urge immediate release of photographer Shahidul Alam, Office of the High Commissioner (August 13, 2018), https://www.ohchr.org/EN/NewsEvents/Pages/DisplayNews.aspx?NewsID=23451&LangID=E. State Department Report on Bangladesh, supra note 26, at 15-16. UN expert group urges Bangladesh to stop enforced disappearances, Office of the High Commissioner (Feb. 24, 2017), https://www.ohchr.org/EN/NewsEvents/Pages/DisplayNews.aspx?NewsID=21220&LangID. State Department Report on Bangladesh, supra note 26, at 4. Id. at 9; Amnesty International Report 2017/2018, The State of the World’s Human Rights: Bangladesh, Amnesty International, 87 (2018), https://www.amnesty.org/en/countries/asia-and-the-pacific/bangladesh/report-bangladesh/.